Today, new EC in Singapore are usually located on the outskirts and new towns which the government have been promoting. 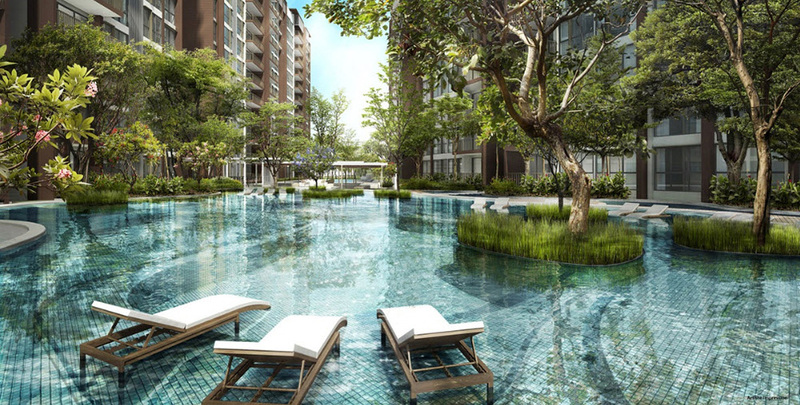 Looking at the list of executive condo where the land have been sold, new and future executive condo launches will be located in areas like Punggol, Sengkang, Sembawang, Woodlands, Jurong, Yishun and Choa Chu Kang. If you are an aspiring home buyer who would not mind staying in these towns, an executive condominium may suit you whether you are a HDB upgrader, or first-time home buyer looking to set up your first home in Singapore. However, it is also very common from home buyers who are unrealistic with their expectations. Such buyers want to stay in an executive condo (essentially a subsidised condominium) but would like it to be located in prime areas, or popular and mature towns like Ang Mo Kio, Bishan, Clementi etc. For such buyers, it is almost a guarantee that the government would not release such sought after places as executive condominiums. If you really cannot compromise on the location, the general advice is to purchase a resale flat in these areas. Your next best but more expensive option would be to find a private condominium in the resale market. The days when executive condominiums were launched in prime areas like Bishan are long gone and would probably not come back. We have encounter many genuine home buyers for recently launched executive condominiums, and asking us for advice on which EC is the best, which unit is the best and to help them with their financial calculations etc. In the past, we do not link you up with property agents. However, we have since established a good, trusted network of real estate salespersons (RES) from the frequent marketing agencies for executive condos in Singapore. Starting from the executive condo Sea Horizon, we will provide information to new executive condominium launches, and you are welcomed to drop us an email with your enquiry and interest in the EC launch. We will then hook you up with the marketing agency in charge and get our recommended RES to attend to you. We hope this will be of greater service to you as having the right property agent who wants to work in your interest can make all the difference! will the normal housing grant be available for the purchases of EC? and currently my girlfriend earns are 3.5k a month while I’m self-employed. what would be the like problems we may face with regards to our income? Yes the normal housing grant is still available for the purchase of EC. Combined Income < $10,000, housing grant $30,000 Combined Income <$11,000, housing grant $20,000 Combined Income <$12,000, housing grant $10,000 If a couple earns about $7,000 in combined income, I don't foresee any problems with regards to purchasing any EC, though you should probably be looking at a 2bedroom unit for affordability. How much loan you can take will also depend on other factors such as your age, other loan commitments etc. Feel free to drop me an email at [email protected] if you need a banker to get in touch with you. They will be best positioned to advise on the finances. may I know the approximate pricing for an EC unit. and what are the available projects that we can register an interests or even consider a purchase at this moment of time. apologies for the trouble, there seems to be a lack of information on EC projects as compared to BTO launches. Yours seem like a fairly straightforward case regarding eligibility since you and your partner have not owned any HDB flat before. A bigger concern would be loan eligibility depending on the combined income vs the price of EC you intend to purchase. EC Units today are priced from between $700+psf to $800+psf. This would roughly translate to above $600k for a 2bedroom unit, to $750k-$800k+ for a 3bedroom unit. Thank you for your question, this website was set up precisely because of the lack of information on EC projects, so we are glad to be of help. Let us know if you need any help with getting a trusted property salesperson to help you, as we work with selected agents who focus solely on EC projects.